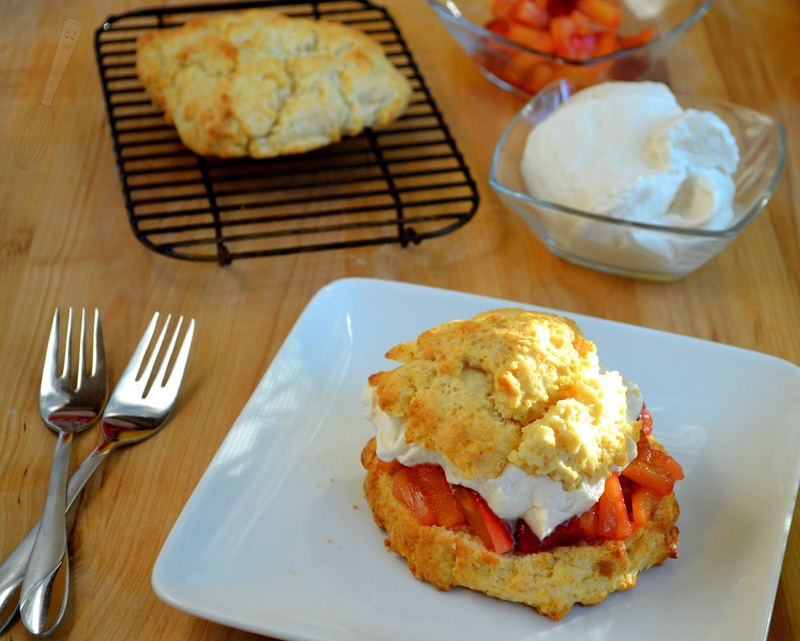 Every time I buy strawberries we always make strawberry shortcakes. Every.single.time. 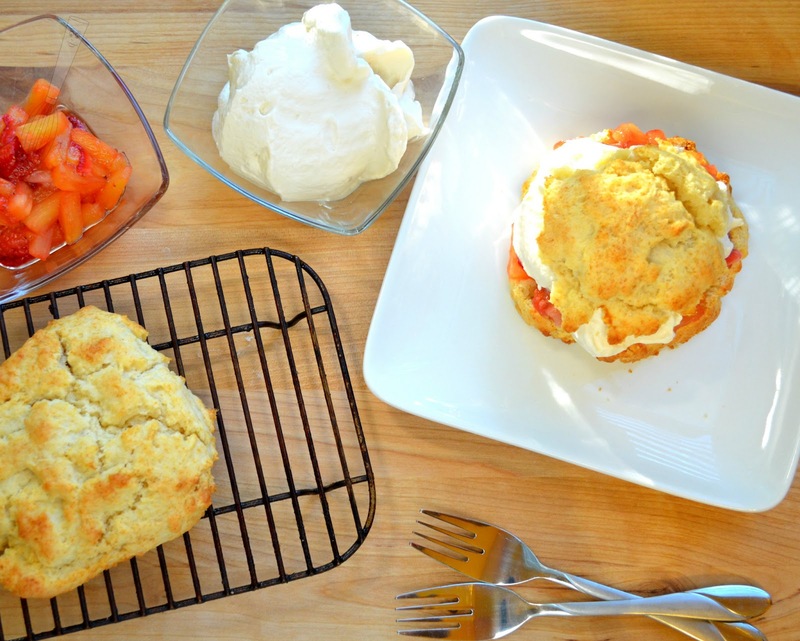 Not that strawberry shortcakes are a bad thing of course. I decided I wanted to mix it up a little though and throw some pineapple into the mix. We can't just toss in some fresh pineapple and call it a day though. I'm way to overindustrious for that. So, I cooked the strawberry and pineapple and served it with some fresh brown sugar whipped cream, sounds good, yes? It was so delicious, this may become our regular shortcake when I buy strawberries. 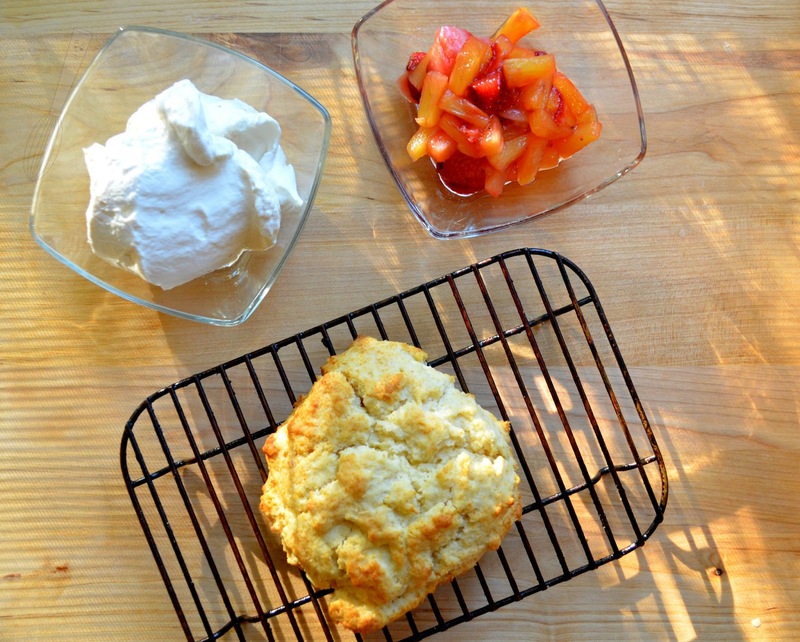 I almost always make fresh whipped cream for this dessert, partly because there is heavy cream in the recipe for the biscuits. I just buy the two cup carton and use 3/4 cup for the biscuits and usually the rest for the whipped cream. If that's too much then just use 1 cup for the whipped cream (or less) and the rest of the heavy cream in something else, or just your morning coffee. I made brown sugar whipped cream because I thought it would complement the roasted fruit and it definitely does. It adds a little sweetness that is a bit different from granulated sugar, and it gave it a nice color too. Something else I love about this recipe is that it makes two generous portions. You could of course cut the bicuits into four servings (even after baking) by just dividing all of the ingredients between four serving dishes. I know that I love a big bowl or plate of shortcake after dinner. I hope you enjoy this as much as I did. Happy Baking! 1. Preheat the oven to 400F. Stir together the strawberries, pineapple, and ¼ cup granulated sugar, set aside. In a medium bowl, stir together the flour, baking powder, baking soda, sugar, and salt. Stir in the heavy cream until the mixture is smooth and a thick dough. 2. Spoon the mixture onto a sheet pan lined with nonstick foil or a Silpat into two separate portions at least 2 inches apart. Bake for 16-18 minutes or until golden brown. Place the biscuits on a cooling rack. 3. Increase the oven temperature to 425F. Spread the strawberry mixture evenly on a sheet pan lined with nonstick foil or a Silpat. Bake for 10 minutes, remove from oven. 4. 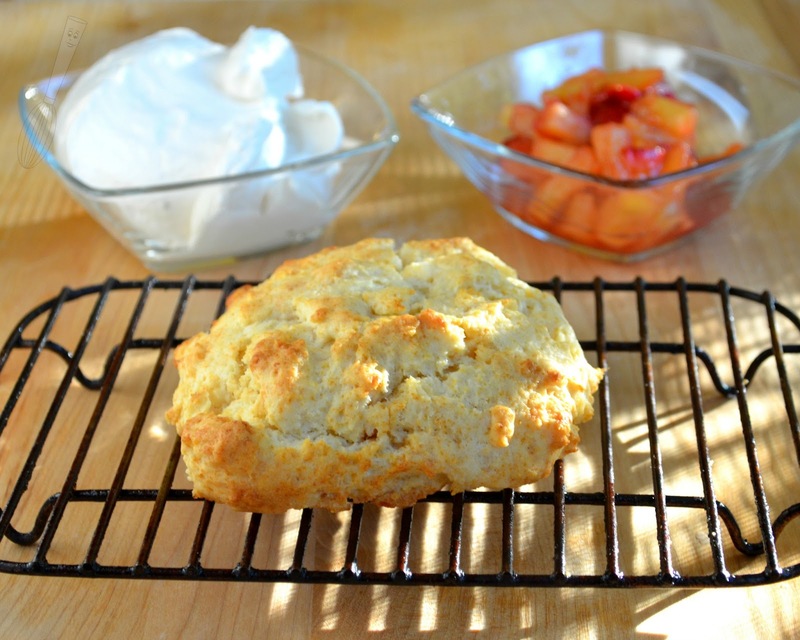 While the fruit is baking, whip the heavy cream to soft peaks. Add the brown sugar 1 tablespoon at a time, mixing in between additions. Add the vanilla extract. Whip until stiff peaks are formed and the whipped cream holds its shape. Do not over whip the cream. 5. 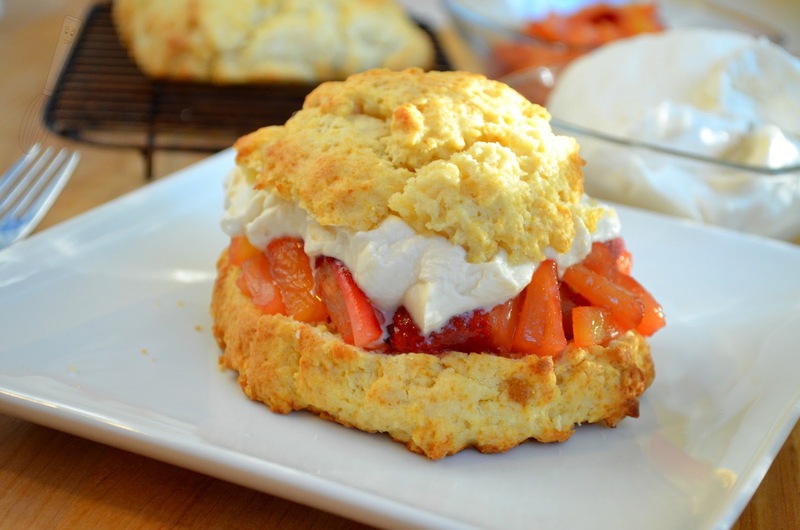 Cut the two biscuits in half, top with the warm fruit, then the whipped cream. Place the top of the biscuit on the whipped cream. Serve warm.